A baby girl was born in Kazanlak, Bulgaria on December 19, 2007. 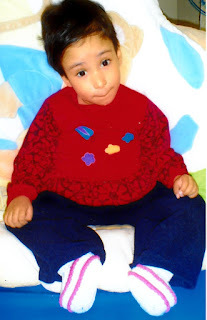 We do not know this special child’s natural parents or any of her family in Bulgaria. We do not know the circumstances of how she came to the Home for Medical and Social Care for Children Orphanage in Stara Zagora, Bulgaria. We do know that her name was Fidana Zeynep Alieva and that she had been in this orphanage for six years. We also know that she had been born with a defect known as spina bifida and had some surgery as a small child. We know that this child’s Heavenly Father had a plan for her life which included Will and Melanie Blackmon and their family in Opelika, Alabama. Fidana became Faith Ana Blackmon and arrived with Melanie at the Blackmon home on June 5, 2014. She immediately knew Will as “Dada” and was quickly laughing at the antics of the Blackmon boys, Web, Palmer, Hank, and Barrett. She also had two sisters, Sophi, who had been previously adopted from Bulgaria, and Evie, as well as a baby brother, Haddon. So Faith Ana, at age 6, joined a large, loving family in a totally different place. She may not have realized that she had traveled halfway around the world, but she knew that she was in a place where she was dearly loved. Of course, in a child’s mind, Faith Ana may have simply thought she had moved to a different orphanage, which is somewhat true, as we are all orphans needing to be rescued and saved by our Lord Jesus Christ. Faith Ana continuously heard the name of Jesus in her three years with Will and Melanie. Jesus always said to bring the children to Him. We know that when Faith Ana died on June 5, 2017, her spirit was instantly with Jesus, and she is in His loving arms. While we may not fully understand how it takes place, we also know that in the “twinkling of an eye” Faith Ana will have a new body, a special and fresh creation of God. Her earthly broken little body which was paralyzed below the waist will be strong, beautiful, and glorified. She will stand, walk, run, jump, play, and praise our Lord for all eternity. Despite her challenges, Faith Ana wanted to learn new things, and she did her best at adjusting to life with the Blackmon Bunch, which grew with the additions of Georgi and Camp. She knew all of her brothers, sisters, and other family members and interacted with each of them. There was mutual entertainment and lots of laughter. Also, there were struggles, but Faith Ana persevered through her several medical issues with an easy-going personality. There were victories along the way. She learned to dress herself, and, using her wheelchair, she was able to do other tasks. She became amazing at putting together 300 piece puzzles. Her smile and warm welcome were a joy for everyone. Our hopes and plans for our children may not always be realized. Will and Melanie had those for Faith Ana, but we recognize that God’s ways are above our ways. We have trust and confidence in God’s sovereignty, and we know His love for us and Faith Ana. She is now secure in His presence with no pain, no uncertainty, and no more struggles. Will and Melanie are so thankful to God for giving them the privilege of three years to the day of being Faith Ana’s parents. Will and Melanie are also grateful to their family, friends, neighbors, prayer warriors, and encouragers who stood with them during the adoption process, health issues, hard days, and this time of deep loss and hurting. They are forever grateful to the doctors and nurses who did their best to help Faith Ana and them with the difficult issues and decisions. They especially want to thank Dr. Sara Smith T for her steadfast and loving support and encouragement and the gift of her time. Faith Ana will be greatly missed by her parents, Will and Melanie Blackmon, her brothers, Web, Palmer, Hank, Barrett, Haddon, and Camp, her sisters, S, Evie, and Georgi, her grandparents, Bill and Judy Blackmon, Kay Ingram, and Stan and Sophia Martin, her great-grandparents, Bill and Patty Martin, her uncle and aunt, Allen and Tiffany Martin, her cousins, Allen, Langston, Ellie, and Mary Chapman Martin, her uncle and aunt, Collin and Caroline Bradley, her uncle and aunt, Rob and Laura Yeargain, her cousins, Brett (Kaitlyn) Dudley, Kaitlyn Dudley, and Millie Dudley, and her great-uncle and great-aunt, Joel and Jan Martin. There will be a graveside service on Sunday, June 11, 2017 at 2:00 P.M. at Garden Hills Cemetery in Opelika, Alabama. Jeffcoat-Trant is handling the arrangements, and Rev. Mike King will officiate. In lieu of flowers, the family respectfully requests donations to be made to First Baptist Church of Opelika, Alabama and designated for the Faith Ana Memorial Fund to help children through adoption and foster care, to care for their families, and to bless their caretakers. shore up the weak-kneed and weary. "Take strength; have courage! There's nothing to fear..."
while sadness and despair evaporate into thin air. *A special thank you to my sweet dad who wrote Faith Ana's beautiful obituary. Hugs! I'm so sorry for your loss!